1.Nice looking and very useful. 2.High boron element is used in this product to replace the large number of harmful heavy metal ions occurs in ordinary glass, such as lead and zinc, etc. Human body won't be affected by heavy metal ions in long-term use. 3.The brittleness and weight of the borosilicate glass are at a much lower level than those of ordinary glass. Therefore, the product looks much thinner than that made of ordinary glass, however, it is light and durable. 4.Due to the low expansion coefficient, high softening point and good thermal shock resistance of the high borosilicate, this product can withstand rapid temperature changes from 0°F to 300°F, and it is suitable to boil water and tea on an open flame. 5.The lid made of food grade 18/8 stainless steel and silica gel ensures the healthiness and harmlessness of the whole product. 1.Cleaning the product with a dishwasher is allowed, however, hand washing is recommended. 2.Please clean the product throughout before using for the first time. 3.It is recommended to clean and dry the product immediately after using to prevent stubborn stains. 4.If there appears stubborn stains such as tea stains, please put the product in a basin or other container with boiled water and vinegar, soak it for 10 minutes, and then wash it with a brush. The lid doesn't seal, so please don't use it as airtight container. ✅Premium Borosilicate Glass Pitcher: Lead-free, lightweight, durable, stove-top safe, withstands temperature 0 ℉ to 300 ℉, so you can pour boiling water into it safely. ✅Large Capacity: 68 ounces high capacity, enough to serve your family or entertain your guests. Fits well in most fridges. 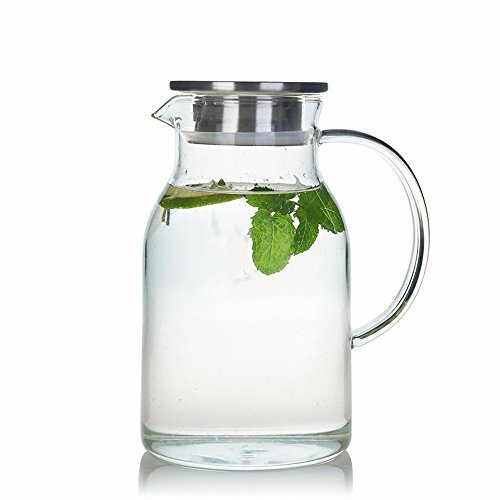 Perfect to prepare and serve cold or hot beverages, water, iced tea, fruit infused juices. ✅Stainless Steel Lid: Great for pouring and keeping ice, large chunks of fruit, tea bags inside the pitcher. Lid is detachable and has a smooth surface, BPA free. ✅Elegant Design: Handmade, beautiful looking, large handle for comfortable grip. ✅Wash Easily: Dishwasher safe, but hand washing is recommended. Simple and easy to clean. If you have any questions about this product by Karafu, contact us by completing and submitting the form below. If you are looking for a specif part number, please include it with your message.